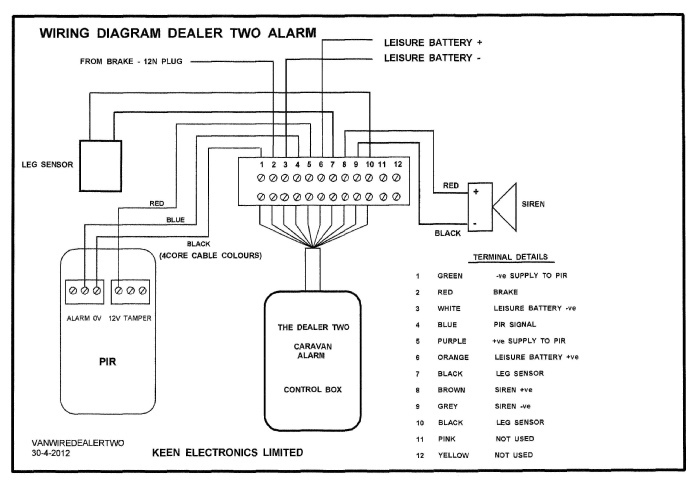 The DEALER alarm is straightforward to install, BUT PLEASE TAKE A COUPLE OF MINUTES TO READ THESE INSTRUCTIONS ! Control box – with 12 way flying lead with terminal block. The control box can be unplugged after installation for testing/fault finding. The control box can be mounted in any convenient location in the caravan, such as in a bed box with the charger. Ensure that the 12Volt leisure battery is disconnected, the mains hook up is disconnected and the 13 pin (or 12S) plug is not plugged into a tow vehicle (or test box). Once it’s location has been decided screw box to the caravan floor or panel. 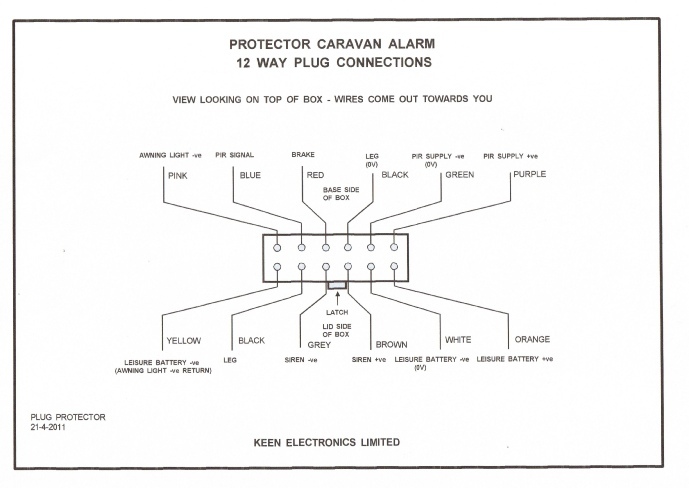 Screw the terminal block to the caravan floor or panel so that the 12 way flying lead can be connected neatly between it and the socket on the control box. 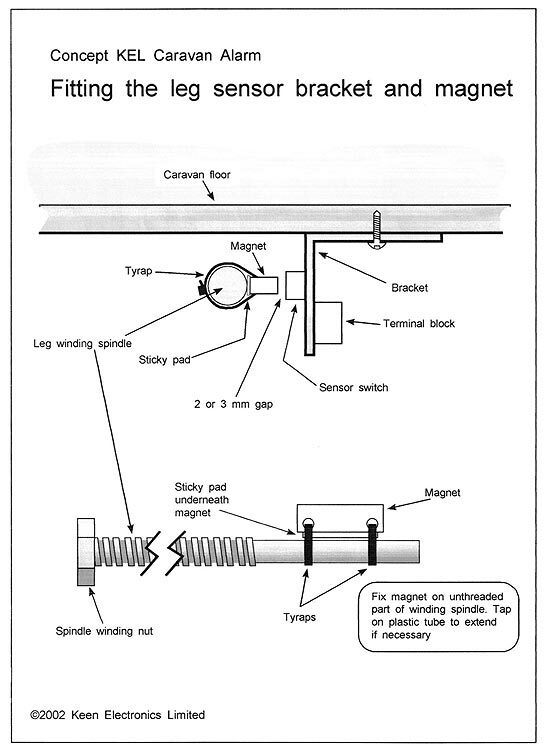 Locate a convenient point in the 13 pin (or 12N) wiring to connect to the BRAKE wire - usually red in colour. NOTE – when pressing the ON or OFF buttons on the key fobs you need to press the buttons for a couple of seconds. Press the ON button on the key fob to switch the alarm ON. The siren should cheep twice indicating the alarm is on. Press the OFF button on the key fob to switch the alarm OFF, the siren should cheep once indicating the alarm is OFF. Now press the ON button, siren cheeps twice and alarm is ON. Now press both buttons together, siren sounds for 2 minutes, or until OFF button is pressed. Once the internal re-chargeable battery has been charged (by the leisure battery), disconnecting the leisure battery. When the alarm is ON and the alarm is triggered the siren should sound for 2 minutes, unless switched OFF using the OFF button on the key fob. 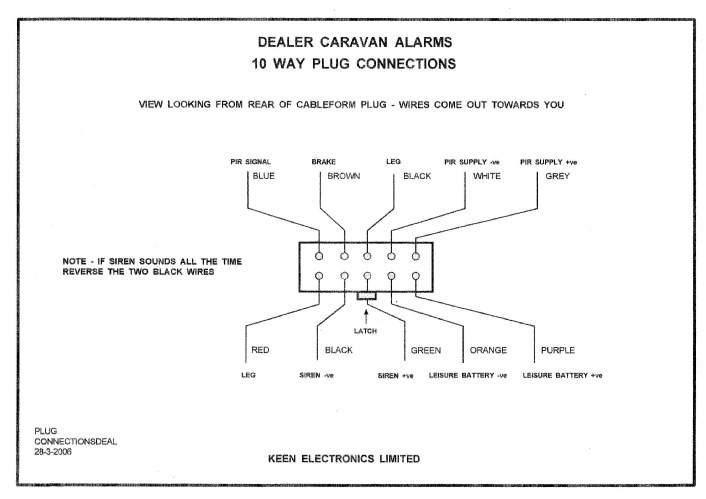 IMPORTANT NOTE ONLY APPLICABLE TO CARAVANS WITH 12N & 12S PLUGS – if the caravan is fitted with a stabiliser using fibre pads an electrical connection will not be made through the tow ball. This will prevent the alarm from being triggered when the 12N plug is inserted. The alarm will however be triggered when the 12S plug is inserted (as well as the 12N plug). A way round this problem is to insert some conductive metal gauze (wire wool scouring pad) into the cup of the tow head. Should a thief hitch up a connection should be made through the metal gauze.